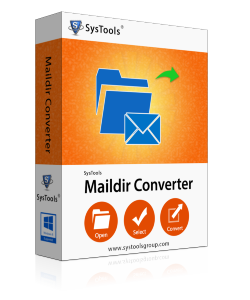 SysTools Maildir Converter Software enables users to instantly perform the simultaneous conversion of bulk Maildir files & Backup Maildir Files (postfix,Dovecot, Mutt, Kmail & other linux based emails clients ) into multiple file formats . It is a versatile software, which provides several options to export Maildir to Outlook PST, MBOX, EML, MSG, PDF, and HTML after browsing a single or multiple files in the tool. The software generates an instant preview of all the files chosen by the end user before archiving Maildir files into multiple file formats. The message attributes and attachments will be loaded on the preview panel in same format and styling as the original one. The email content can be seen in different technical modes like Normal, Hex, Properties, MIME, RTF, Message Header etc. The Maildir to Thunderbird converter renders a useful provision to backup data from Maildir files and saving it in Thunderbird (or MBOX supportive email client like Apple Mail, Entourage, Eudora, Netscape, Pocomail etc.) file format. It also offers option like Date filtering, folder-wise filtering, etc., to change the default settings of output files.Users can create per folder MBOX files while exporing Maildir files to MBOX & easily import them in any MBOX supported emails clients. 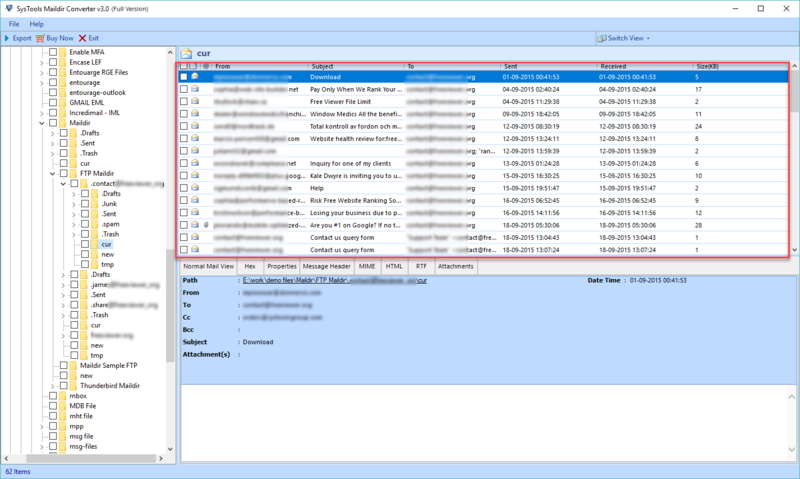 Maildir converter tool is capable of saving messages with their attachments of all the sub-directories like cur, tmp, and new. From the preview pane, users can check the checkbox of all those folders / emails that they want to save in resultant file format. There is no limitation imposed in Maildir to MBOX Converter software regarding the size of Maildir files (postfix,Dovecot, Mutt, Kmail & other linux based emails clients ) . It works smoothly with any file size without any restriction. 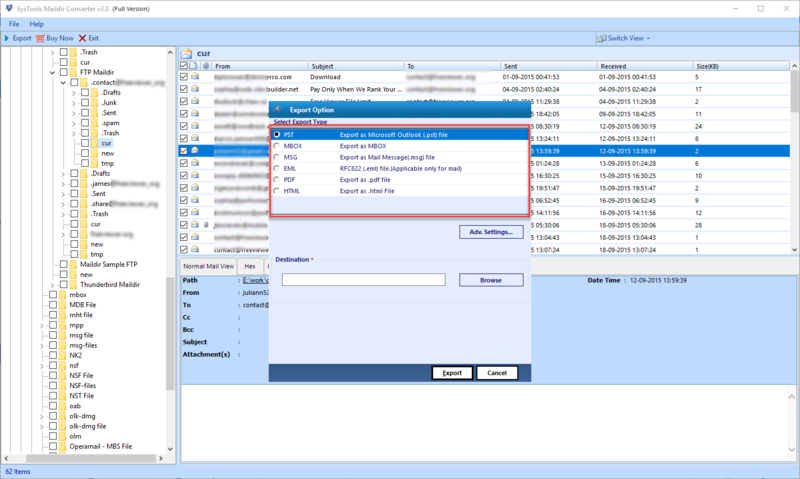 Date Filtering : Export Maildir messages of selective time period mentioned by the user to export data within specific date range. Is it required to have Outlook installation on the system before performing Maildir to PST conversion? No, the application offers a standalone solution to convert Maildir to PST file format. 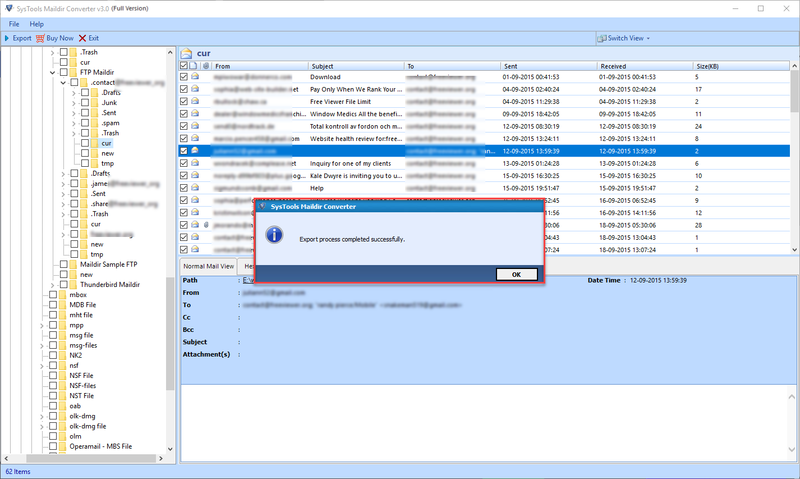 It does not require any supportive program like Outlook 2016, 2013, 2010, 2007, 2003 for working with it and knows the independent way to attempt the migration. Moreover, it also supports to export Maildir to HTML, MSG, EML, MBOX & PDF file format. How can I attempt selective email conversion (independent of date filtering) with help of this SysTools Maildir to EML Converter? Is this Maildir converter compatible with all versions of Adobe Acrobat Reader to open and view resultant PDF file? Yes, Maildir converter software supports all versions of Adobe Acrobat Reader to open and view output PDF. Does the Maildir converter exports the attached documents of Maildir emails to PDF? Does this Maildir to MBOX converter program requires any server connectivity for performing the conversion? No, our software convert Maildir to Thunderbird even in absence of the server connectivity. It is totally a standalone utility, which export Maildir to mbox without any dependency issues. Will I be able to test your application to merge Maildir folders, before investing money on it? Yes,we are offering the SysTools Maildir converter software in two versions: Demo and Purchased versions. 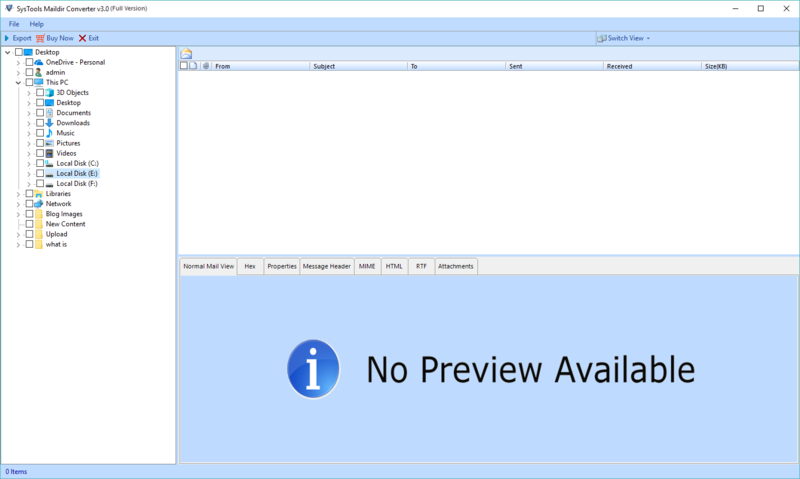 Trial version is a copy of the software by which you can easily examine potential and performance of it by exporting Maildir to PST , MBOX, EML, MSG, PDF, and HTML. Can anyone tell me the default location of Maildir control files in Dovecot? The Dovecot Maildir location is mail_location = maildir:~/Maildir:CONTROL=/var/no-quota/%u. The best part I liked about this Maildir converter software is its features to transfer single or multiple Maildir files to PDF at a time. After utilizing this tool, I can proudly commit that the software is best tool to export Maildir emails to PDF without losing a single bit information. There have been multiple services around which I came across while searching for solution to export Maildir to Thunderbird. I am at utmost level of satisfaction with this SysTools Maildir to MBOX Converter product and the noticeable fact is that I was able to examine the software beforehand, which provided me assurance of its success to export Maildir to EML File Format. Thanks a lot to team. SysTools Maildir to PST converter utility is the finest product, which I found after a long duration to merge Maildir folders. It’s been quite a few months I have not used an application worth being title as great that enables to Backup Maildir Files (postfix,Dovecot, Mutt, Kmail & other linux based emails clients ) into multiple file formats . However, this one completely impressed me with its performance and output. Head off to the developers who came up with such an innovative application to convert Maildir to Outlook PST .